During his tenure in the NFL, Cam Newton has elevated his status in the league from hyped first overall draft pick to one of the truly elite quarterbacks in professional football. Newton first entered into the spotlight with football fans during his Heisman Trophy-winning season at Auburn in 2010 that culminated in a BCS National Championship for the Tigers. Growing success with the Carolina Panthers has made him into one of the most popular modern players and helped push Cam Newton rookie cards squarely on the collecting radar. 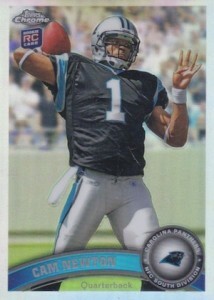 Shop for Cam Newton Rookie Cards on eBay. 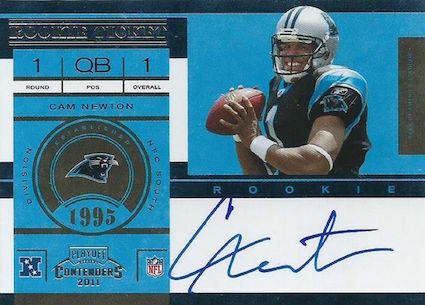 Most of Cam Newton's top rookie cards are autographed and have been highly sought-after during the majority of his NFL career. While many of his rookie cards are already pricey, his elite play and heightened visibility, especially from a deep playoff run, can only make his rookie cards more valuable and favored within the industry. Cam Newton has a large number of rookie cards for collectors to choose from, but we are narrowing the field down to ten of the best for fans to track down and add to their collections. Newton has many affordable non-autographed rookie cards, but his Topps Chrome is arguably the best of this bunch. This card is not only easy to find, but also is an attractive option because of its cheap price tag. Like all Chrome cards, collectors can also seek out some of the different parallels that exist within this popular product for added rarity and value. 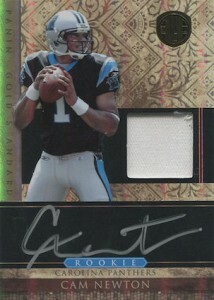 Cam Newton's Panini Gold Standard autograph is one of his more budget friendly and plentiful rookie signatures. With a print run of 325 copies, there are always a few of these floating around. Adding to the appeal, a small jersey piece sits above an on-card autograph for Newton. The 2011 Panini Plates & Patches set offers another great option for collectors looking to add one of Newton's autographed rookies. Similar to the Gold Standard autograph, this card features a larger print run and can be found without much difficulty. 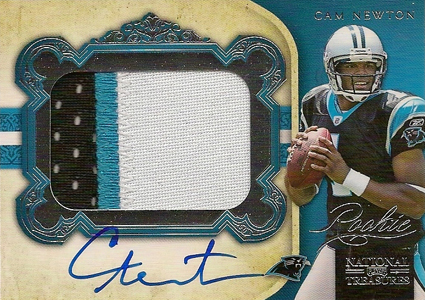 This Cam Newton rookie showcases a nice on-card signature paired with a solid jersey swatch. Often these cards can be found with multi-color patch pieces, but those cards usually carry a premium. Crown Royale originally started with Pacific in the 1990s and the product was known for the beautiful die-cut cards which continued when Panini decided to revive the brand. While the die-cut cards in Crown Royale are still popular, the Newton autograph in the Silhouettes subset has quickly become a hobby favorite. Despite having a smaller print run, is still not too difficult to find these online. The large jersey swatch set behind the die-cut background offers plenty of room for the large on-card autograph. Featuring one autograph per pack, 2011 Topps Precision was a short-lived brand with a premium focus. The cards had a great design with a dark background, thick card stock and on-card signatures. Newton's card is more limited than the other base rookies, and the main version is numbered to just 50 copies. 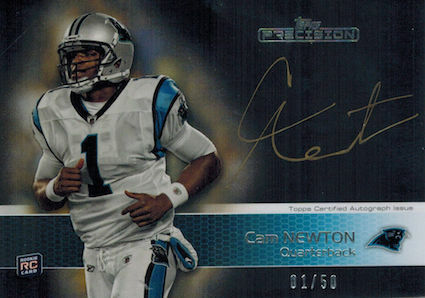 Similar to Precision, Topps Inception is another per-pack autograph product that features an autographed rookie card of Cam Newton with a very limited run. While most rookies have base rookie autographs with print runs in the hundreds, the "base" rookie for Cam is actually the Green parallel that is numbered to 50. Newton also has a Red parallel, numbered to 25, but it does not surface often. The Playoff Contenders Cam Newton rookie is the only signed card on this list without a serial number, but it remains extremely popular with football card collectors due to the strong reputation that this product has garnered over the years. This is further helped by the large on-card signature. In addition to the base version, Newton also has a very subtle variation that removes the band by his elbow and the text near the top of his face mask. 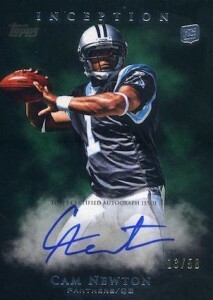 Cam Newton's high-end autographs are generally tougher to find due to their low print runs and high demand. However, his 2011 Five Star autograph is somewhat an exception to the rule with a print run of 199 copies. Another great football product from 2011, these well-designed cards were characterized by a thick card stock and a strong checklist that featured a nice group of rookie cards, as well as a strong presence from some of the games all-time greats. 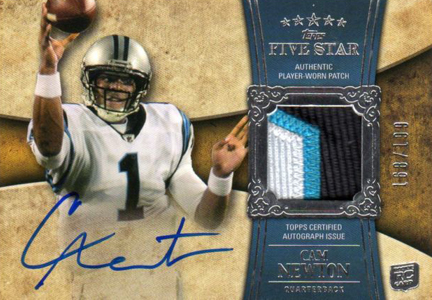 This Cam Newton rookie features an on-card autograph and, typically, a nice piece of patch. While cards featuring players in their college uniform are not generally thought of as "true" rookies, it is still hard to make a list of Newton's top first-year options without including his card from 2011 Exquisite Collection. 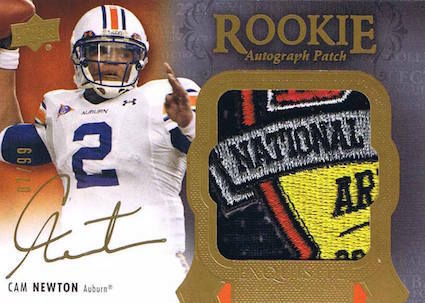 These cards feature large patches from Newton's Auburn jersey and a nice autograph signed in gold ink across the bottom of the card. Regardless of the rookie designation, this card still remains one of Newton's most popular cards from 2011 and also one of his most expensive. 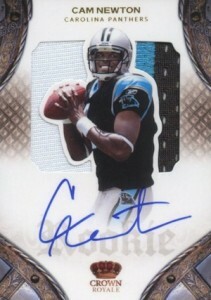 2011 National Treasures has long been the place to find the most popular Cam Newton rookie card. 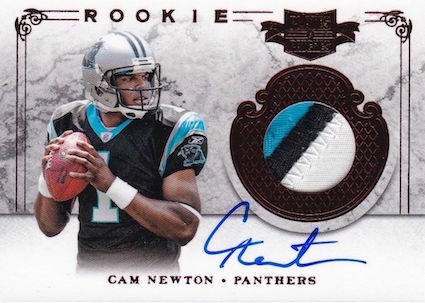 This super high-end Panini release features a great checklist of rookies and veterans and Newton's main card offers an on-card autograph and a giant swatch of jersey or patch. While the print run of the most basic version is numbered to just 99 copies, there are several parallels that feature smaller print runs and premium patch pieces. If there is one Cam Newton autograph to add to your collection, this card is clearly the best to pursue, but be prepared to spend $500+.